Notes: *Both scores use with caution **High emotional disorder-anxiety score use with caution High/low behaviour was determined by the 10th/90th percentile cutpoints (as appropriate). For details on how these scores are developed see The Survey of Young Canadians (SYC) http://www23.statcan.gc.ca/imdb/p2SV.pl?Function=getSurvey&SDDS=5179 -accessed June 22, 2017. 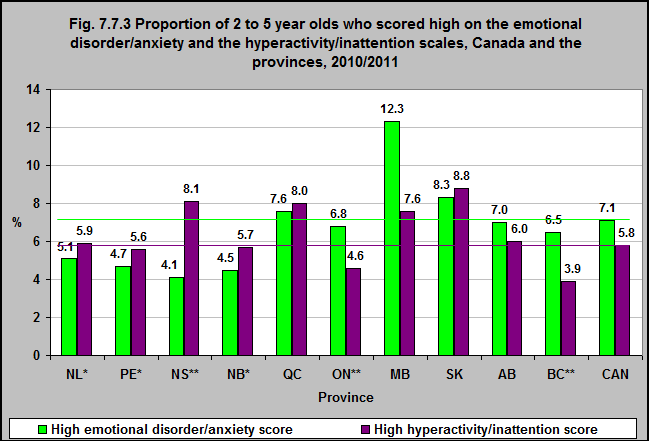 In 2010/2011, the incidence of 2 to 5 year-olds who scored high on the emotional disorder/anxiety scale varied between provinces. In Manitoba and in Québec, 12.3% and 7.6% respectively scored high on this scale. In contrast, percentages were 4.1% in Nova Scotia, 4.7% in Prince Edward Island and 4.5% in New Brunswick. The incidence of 2 to 5 year-olds who scored high on the hyperactivity/inattention scale also varied between the provinces. While 8% scored high in Québec, in BC only 3.9% scored high.